E, who surely has the least Googlable name of all our forum members, has made a really excellent little card case for the Raspberry Pi. (Please let me know what your real name is, E, if you’d like me to credit you properly!) It’s something you can print at home; if your printer won’t take card that’s heavy enough, just print it on paper and trace it onto the card. The Punnet. Click for a PDF to print, cut out and fold. E says in his associated forum post that this is an alpha version of the Punnet; he’s not been able to test it with a Raspberry Pi because he’s one of the poor souls who’s still waiting for his, and people have reported that a couple of the ports are a little off. You can download a final version, with ports in the right place, from SquareItRound – there is also a zipped SVG version you can edit yourselves for modding purposes. Have a go and let us know how you get on! That inspires me to make a robot body! 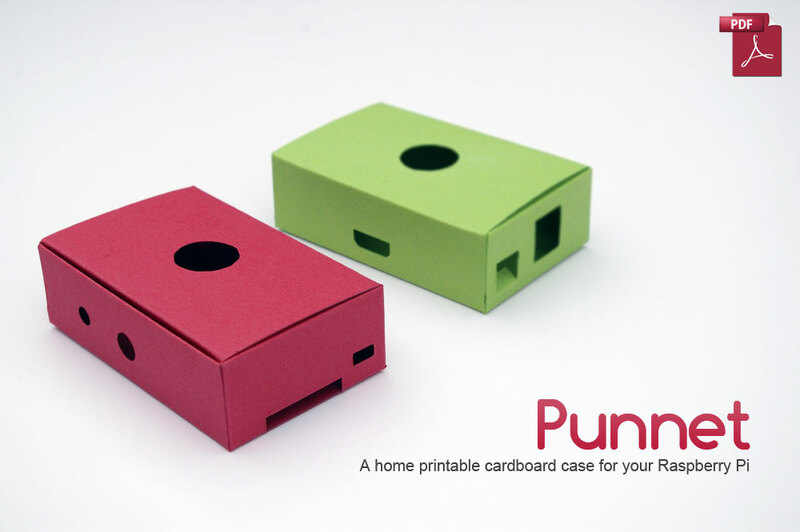 Where can I find some decent cardboards with nice color? Quite a fruity name “Punnet” don’t you think, my first thought was “Pick your Own” so I have my Punnet of Raspberry Pi with me today. Surely PYO (pick your own) is when the Raspberry Pi is available in all good high street shops and you can Pick Your Own of the shelf – rather than ordering online!! A great idea, but it doesn’t quite fit sadly. The power, RCA and HDMI holes all need shifting a little bit along. What is the paper size ? I just put this little Punnet together. Unfortunately the Audio and RCA holes are a couple of millimetres too far apart, as shown in the 5th picture. Otherwise, it’s a great little thing! i like green colour yeah! btw why it’s call the punnet? And your lid, like mine, doesn’t seem to close well either. I hope this takes off. I imagine kids will enjoy rolling their own designs, making their Pi’s personal and such. I agree most kids know what a packet of Riz la Croix look like, but I think cigarette papers are a bit thin for the job. isn’t this a bit dangerous? the paper could easily (well, easier than other material) turn in fire when an electric problem occurs and help the fire to expand further. No, a paper case is not dangerous. We wouldn’t have passed the very stringent safety tests we’ve been subject to if that was the *cough* case. Thanks, Liz! That was my first question too. Remoember to have adult supervision and ware safety goggles and anticut gloves when you make it. Paper, sissors and knives are dangerious. I have been hurt by all three, in isolation, as well as in combination, on various occasions, so what counts as dangerous is a matter of perspective. I have seen kids play with cobras, with little or no incident. P.S. In other news, I received my RPi today. Let’s play. Using a metal lined flexible case is a bad idea, any flex in the case & the aluminium foil could cause a short circuit. You could wrap the outside in foil if you want a shiny box, but be sure that the ports and connectors don’t touch the metallic edges. It may provide some EM shielding, but the RasPi should already be safe in this regard. From the PDF it is made to be 2mm high so that spacers or glue dots can be put under it. Again not sure if this is your problem. I’ve also seen problems with PDFs (fit to page) as US A4 is different to UK A4 and US also uses Letter, so maybe see if Fit to Page is selected when printing as this might fix things. That’s a fantastic idea :) nice that you could use it as a template for other materials too, I wonder how long before someone thinks to run the card through their printer to print of their own fancy custom designs? :D I can see a rash of celtic design pi punnets hitting the forums v. soon!! Or perhaps laminate the card and see about a case that’s a bit more capable of standing up to the outside world. i used the box in which Raspberry PI arrived. If you try this you might want to use a folding bone to score the paper. A folding bone not only helps you get a straight line but also compresses the paper fibres in order to strengthen the fold and it gives a crisper edge. For cardstock material of any thickness it would be wise to use a double score line at the folds to account for the material thickness. There is also a method of scoring using a bone with a nick in the end. A metal straight edge is clamped between two pieces of wood so that just a small metal ridge is exposed, no more than a mm. A nick in the bone end slips over this metal ridge. Placing your card over the metal ridge and scoring with the nick in the bone gives you a U section in the card which when folded back on itself gives the necessary overlap to clear its own thickness when you fold, so that you get crisp flat folds with much less bulging. Of course the design of the case should take into account these thicknesses. Cardboard engineering is a precise art but done well can give very good results. Liz – I believe this idea was first proposed by forum member eric_baird on 4 December and first implemented as a PDF by forum member tzj on 5 January in the Cases thread “Printable cases (using OHP film)” – (http://www.raspberrypi.org/phpBB3/viewtopic.php?f=40&t=2949). The PDF tzj developed is here: http://pdfcast.org/pdf/raspberry-pi-card-case-revision-1 and has the advantage over the Punnet of not requiring any glue, as it uses tab-into-slot construction. Like the Punnet, it may also need to be tweaked dimensionally, as it hasn’t been tested with a production board, AFAIK. In either case (pun fully intended :) ), using Mylar or other stiff transparent sheet plastic provides the advantage of being able to see the board, and the Pi logo, connector labels, etc., can be printed (in reverse) on the inside surface so that the printing is protected from being rubbed off. Will it not set on fire? It only consumes a few watts of power at low voltage – barely enough to be felt by your fingers. As long as you don’t do anything to it you wouldn’t do to your own skin, like attempt to smoke it, otherwise expose it to open flame, or build it out of magician’s flash paper, it will be just fine. I very much like the idea of a flash paper case. Boom! looks good – kids will love it – but Please lets have some safety warnings about using a very sharp modelling knife to cut thick card – use a safety rule which lifts fingers out of the way of the knife and always cut away from fingers… sounds quite obvious, but I do this sort of stuff in school and its amazing how many children will cut towards fingers whilst holding paper or card steady… i’d hate for there to be lots of people with new machines but with very nasty cuts that take weeks to heal. Hang on – you mean that you want me to include instructions on using scissors correctly every time we suggest someone cuts something out? I think Douglas Adams had something to say on this point that revolved around toothpicks. Look at the print out …it says to use a knife…not scissors…different kettle of fish altogether. I thought the product was aimed at children in schools…..? If you’re trolling, you’re doing a lousy job. Andy, no offence, but if children cannot be trusted with a cutting knife or scissors, they shouldn’t be fiddling with a Raspberry Pi. There are many more “dangers” if you have to look at it from that angle. I once had someone tell me that the laboratory SOP (standard operating procedures) were bad becuase they didn’t include instructures on how to use the printer to print them out….. I nearly had a stroke. Just to say many thanks to people for the feedback on the fit, and I’m pleased people are finding it useful. :) As I don’t yet have my Pi, I knew in most likelihood some of the measurements would be off, so I will be updating the design based on the feedback. Also, if you have suggestions, ideas or questions you’d like me to answer, if you could please ask them on the Punnet thread in the forum, as there’s no way I’m going to be able to keep track of them here. Cheers. sweet, one that fits… that is the glue one, yes? Looks great however I’ve already brought a ModMyPi Case! I really like it. But I printed it, and the lines where you have to fold, disappeared. Got to have the best input devices, given all the inputting I do. I bought a well thought out clear acrylic case from a UK designer. Well worth supporting him to see what else he comes up with. And he donates 50% of profits to charity. That’s me and I am hoping Liz will tell me her preferred method of paying to the Foundation. I know my contributions will be chicken feed compared to the CEO of Google, but if a million people chipped in a pound we might have slightly less dumb kids in future. If you email me, I’ll put you in touch with Jack, who deals with donations. It doesn’t seem to line up for me. The audio port and micro usb slot is out of place by a few millimetres. I’ve given up on getting one, but maybe someone like E should be pushed to the front of the line/given one. For the work hes done and being promoted on the front page. It’s cool but it might help to have a scale somewhere on the page. I’m not sure if it will come out of the printer the correct size. Print it on paper, cut it out in wood. Glue it with woodglue. Paper won’t last. Is ok if nothing;s going to touch the pi. but when you’re (re)plugging ports and devices, paper will wear out. Now I know why I let my wife buy a paper cutting machine/paper craft bits and peices :-) Cheers and well done! Do you think a clear resin case like the one shown here could work ? I had a go at putting my Pi in it. First attempt. I cut a Manilla Folder to A4 size then ran it through the printer. Used a swiss army knife to cut it. The audio port and HDMI are out a little in the current Aplha 3 design. I think the Composite Video might be cut a little high. The Ethernet is quite recessed. Its a brilliant little case, I’ve just finished making one. I added in an extra window next to the USB sockets so I could see the LEDs. nice case! May you publish the PDF file of your work? I’m still waiting for my RasPi. My idea is to print the paper box and cut it on a plastic sheet (Comb Binding Cover ? ). It will be a plastic box made the same way as if it was made of paper. It will be harder/stiffer than paper and it will be as simple as cutting and folding a sheet of paper. This is a great idea, but have just got the Raspberry Pi and made the case and it won’t fit, it seems to be a little to small. I have printed it on A4 so not sure what the issue is. But a little frustrating after spending what seemed forever cutting out the circles for the ports. BUT THE RASPBERRY PI IS AWESOME!!! Try printing it again, but this time stop at the settings box that lets you choose between “Fit to Paper” and “Actual Size”. It’s a common mistake. There are free PDF templates for you to download and use. The size is A4 but should fit on US letter paper. Just make sure you don’t let acrobat resize when you print. Please send me an example if you make one up and let me know how you got on. This fantastic case template should be printed on the box that the Pi boards come in, so that every Pi would actually come with a basic case, that would be fun for kids to cut out and assemble. Isn’t it amazing that the simplist ideas so often seem to be the most obvious, yet the cleverest, in retrospect! Chris, you’re a genius! However you’ve woken me up, so now looking for more thoughts like this. Just got my Pi this past monday..got it setup serving IRC and a webserver…found this case printout and glued it to some stout cardboard I had laying around. I had to do some “field modifications” to fit as I went along. The power hole was a bit high –a downward cut to enlarge the existing hole was what that needed. The RCA connector was hitting high & left of the hole template–again , some extra carving. The usb port was a bit narrow. All fairly minor deviations that were easily addressed with a single edged razor blade and eyeballing what needed to be whittled away. Some clear package tape and it closes well . Great idea. I have printed one “box”, but hole for “Audio”, next to the “RCA Video” doesn`t fit on my Pi. I have moved it a little, try to check website in this comment. Hope it will fits yours Pi. My wife, a card maker, cut out the protype, used card. All holes seem to fit except the “audio socket”, seems to be +/- 7 mm out of alignment. Considering E. didn’t have a Rpi he has done extraordinary well. if one builds wooden furniture DYI kits as sold by for example IKEA, they come with a small palstic bag (one may call it sactchet in UK) of glue that is perfectly suited to glueing wood or paper, you may get it from IKEA for a coin, if not free from their service counter. it is possible to lacquer the paper giving it glossy look, using hairspray after the box has been built make . the best things about sublimation glue is it’s water solubility, and that even if you spill some on your fingers, it peels off easily since it is not good glue for living skin with oil in . Trademarks of companies are just that, and are used here only to clarify matters, no endorsement is made for any of the mentioned companies. I too noticed the audio output connectors offset, but it is easy to expand the hole. I redid my punnet in Lexan…I took the main template printout (cut off the flaps) and glued it onto lexan and cut/dremeled out the ports. I used chopsticks from chinese food for the wood bracings and small screws to finish off the job. The website is hosted on the Pi itself. A4? Thats pretty hard to come by over here in the US. Any chance of making a 8.5×11 version? I know the Rpi foundation is UK, but Rpi users are from all over the world. Would be nice if people didnt keep forgetting that and just assuming everyone is in the UK. I too am in the US (Tucson Az) and printed the pdf on 8.5×11 cheapo laser paper then glued it on lexan. I did have to make some modifications on port holes for RCA , speaker jack etc. This was easily done by holding the pi and positioning where the case panel would be , then use a sharpie marker on the glued paper template to mark the modified position. Then attack it with a dremel tool. Once it was done the paper and the protective cover-film of the lexan gets peeled off & discarded . I took the design and made it to where all the flaps come out from the top and neatly tuck underneath my Raspberry Pi which made it easier to overlay a picture as a template to cut out. If you have a laser printer and a full-sheet mailing label, just print on that, then apply the label to the card stock (or a piece of a cardboard box — not corrugated). Then instead of super glue, use clear packing tape to carefully wrap the whole thing, openings and all (neater). Then use a sharp “razor” knife to cut the tape covering the openings, and you have a glossy case. You might want to cut away some of the tabs beforehand, since the tape will provide the necessary closure. The downloads seem broken. Anyone have the files hosted somewhere? I’ll host them on my box account if need be. Excelent…. Thanks. It worked in perfection. I used Inkscape to edit E’s original. Nice job on that, these are minor tweaks. The new version is here: http://www.filedropper.com/punnetnetmk1. The zip file also includes two PDFs, one for A4 printing and one for letter. I can’t download it from the link you provided. Sorry, filedropper seems to have gone commercial? Thanks you very much, this fits perfectly. I didn’t even use any glue. I cut a slit in the central part of the dotted line above RCA Video, and I cut the opposite tab so that it fits in the slit. This way, I can open and close the box and it keeps closed pretty well. This is a great little case, and fits perfectly. It is easy to make and works great. I recommend this to all Raspberry Pi users. At the Surrey & Hampshire Hackspace we did a modified version of the Punnet for the Brighton Mini Maker Faire. Added GPIO pin identification to the case so no need to hunt for the pin outs. It’s downloadable from our wiki. A perfect temporary case! I believe I’ll still get a plastic one when I finally get a 3d-printable design I like, but in the meantime I made my own little mod of this, which makes me very happy indeed :D Thanks for sharing! It comes with the raspberry design cut out on the top.